Beginning in the summer of 1965, even amidst the controversy regarding the student body and faculty, Dr. Reid and administrators at the University of Virginia in Charlottesville were busy planning for Mason’s change in status from a two-year to a four-year degree-granting college. At that time fewer than six-hundred students were enrolled at Mason. But there was no denying that Northern Virginia’s unprecedented growth, highlighted by a dramatic increase in the population of college-aged men and women, pointed up the coming need for a four-year college in the area. Both the University of Virginia and the Commonwealth were acutely aware of this need. In a December 1965 report to the Governor and General Assembly, Virginia’s Higher Education Study Commission, chaired by John Dale Russell, recommended that new four-year institutions of higher learning be introduced in the Northern Virginia and Tidewater areas of the state. The “Russell Report,” as it was commonly called, also recommended that Mason eventually become a new state university, independent of the University of Virginia. Finally, it recommended that George Mason have a more liberal admissions policy, allowing more college-aged students from the area to attend. Reid, his staff, and their counterparts at the University were active participants in this study, supplying necessary statistical data to the commission. 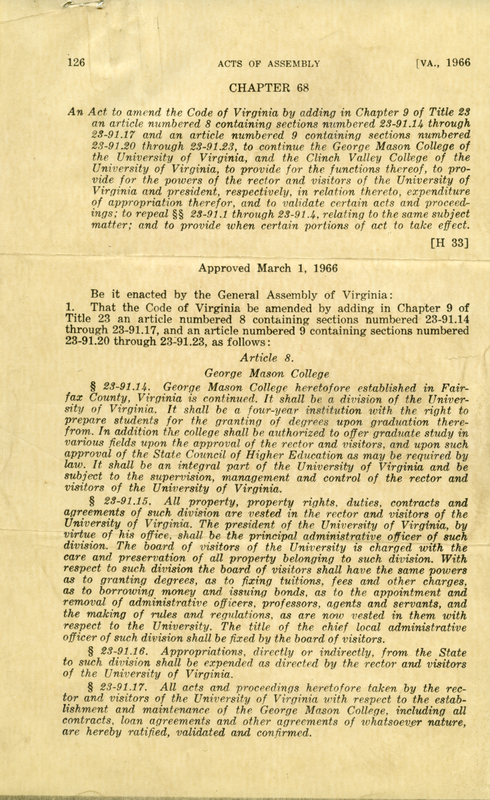 During the 1966 Session of the Virginia General Assembly, Alexandria delegate James M. Thomson, with the backing of the University of Virginia, introduced a bill in the General Assembly to make George Mason College a four-year institution under the University’s direction. By then the legislature was fully aware of the need as it had already digested the contents of the Russell Report the previous winter. The measure, known as H 33, passed the Assembly easily and was approved on March 1, 1966. Although not independent, George Mason College was now a degree-granting institution and managed some of its own administrative functions at the Fairfax campus. By September 1966, George Mason’s new chancellor, Lorin A. Thompson, was reporting directly to the University of Virginia’s president Edgar F. Shannon instead of former Chancellor of Community Colleges, Joseph Vaughn. Even though the Board of Visitors and president at Charlottesville still made major decisions regarding George Mason’s overall operation and future, there were two advisory groups made up of Northern Virginians, which helped advise the University on issues pertinent to George Mason College. The Board of Control was made up of eight prominent Northern Virginians appointed by local jurisdictions, while the Advisory Board was made up of local citizens appointed by President Shannon. Report of the Higher Education Study Commission [to the Governor and the General Assembly of Virginia] Prepared by John Dale Russell, Richmond [Commonwealth of Virginia] 1965.